If you like animated movies, there is something special one just came out from Shout! Factory & GKID. They introduced fantasy/science fiction romance Satellite Girl and Milk Cow. The story starts with a satellite flying in space and it catches lovely song with its transmitter. Following the sounds the satellite descends to Earth to find where those emotions are created and transformed into the music. On the way to the source of the love ballad the satellite becomes involved into a mysterious battle and turns into Satellite Girl. At the same time the musician Kyung-chun who sings about his broken love, full of emotions and pain transforms into a farm animal, exactly into Milk Cow. There is no reason for Satellite Girl and Milk Cow to be together until powerful Merlin the Wizard who turned into a roll of toilet paper tells that Milk Cow needs protection and some villains try to catch him. Milk Cow is attacked by various monsters and Satellite Girl tries to protect him multiple times. Milk Cow, the guy can hardly accept himself as a cow and struggles not only with broken heart but also with his appearance. Satellite Girl is not good in human relationships, she often cannot get why if Kyung-chun likes someone, he cannot say it straight without being hesitant and shy. If his girl does not love him, it is time to move on and forget her. It was interesting to watch how practical tech device who tries to understand human emotions over the time turns into human. And the guy who turned into Milk Cow realizes that there is much more in this world he never noticed before. Even cow has something special to offer, live and enjoy the life. While Kyung-chun suffers and tries to heal his wounds, he put up with the fact that he will be a cow forever. Until he finds that Satellite Girl left and may never come back. There are some amazing and touching moments when Satellite Girl brings a bouquet of favorite flowers to Milk Cow to eat or when Satellite Girl needs a charge at the gas station, you need to watch the whole story. Though flying arms and finger antenna were a little bit disturbing, overall, the story melts your heart and gives some food for thoughts! Satellite Girl and Milk Cow on now available on Blu-ray/DVD from Shout!Factory. This movie is a debut feature-length film in North America from Korean director Chang Hyung-yun, acclaimed creator of animated short films that have premiered and won prizes at festivals worldwide. The release also includes bonus features - the short film Coffee Vending Machine And Its Sword, and trailers. 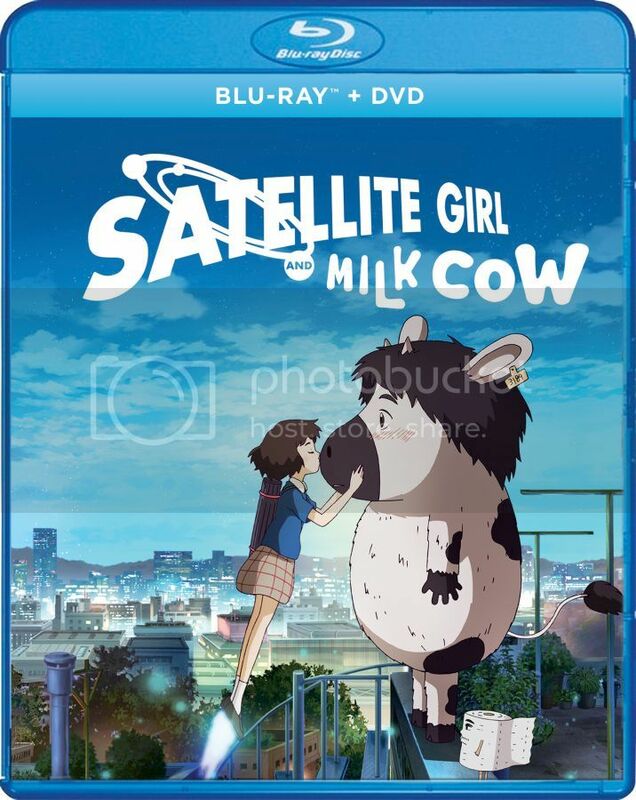 We are excited to partner with Shout!Factory and giveaway a copy of Satellite Girl and Milk Cow Blu-ray/DVD to one of our US and Canadian readers. For your chance simply fill the Rafflecopter form below and good luck! The giveaway ends June 25, 2018! Hi,I would like to win Satellite Girl and Milk Cow movie for my granddaughter.Thanks for the chance! I love anime, would like to win for my cousin and I. My granddaughter would enjoy Satellite Girl and Milk Cow movie. It looks like fun. I would like to win for my nieces to watch. Like to make a day out of it! I would actually love to win this for my wife!